Holmes & Watson (film, 2018). A 2018 American mystery buddy comedy film with "PG-13" rating by Sony Pictures Releasing/Columbia Pictures. Directed by Etan Cohen. Official Trailer. 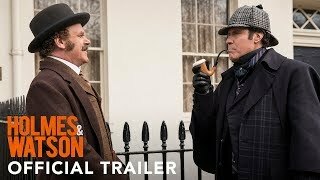 Holmes & Watson is a 2018 American mystery buddy comedy film directed by Etan Cohen. 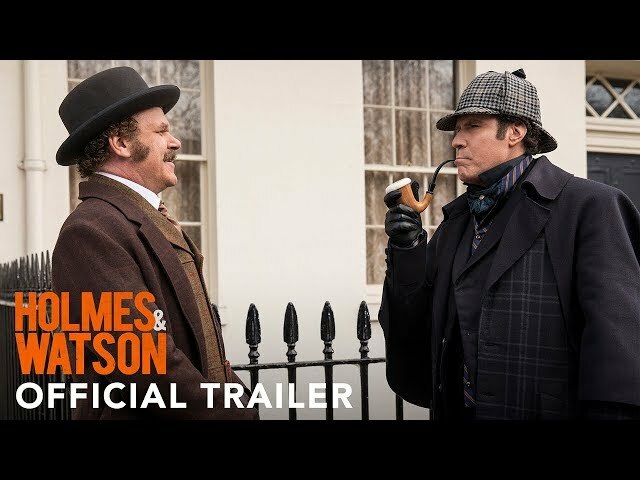 HOLMES AND WATSON - Official Trailer (HD). In 1881, Sherlock Holmes meets and befriends John Watson. Years later, Holmes is viewed as a legendary detective. Both he and Watson are to view the trial of Professor James Moriarty, but are temporarily waylaid by a package sent by Moriarty and brought to them by their housekeeper, Mrs. Hudson. Once at the trial, Holmes declares that the man on trial is not Moriarty and is instead someone named Jacob Musgraves, who is incapable of committing the murders due to tremors in his hand caused by excessive masturbation. Despite unsuccessful attempts by Inspector Lestrade to convince Holmes that his deduction is incorrect, Holmes is convinced that Moriarty is currently traveling to the United States. After the trial the duo travel to Buckingham Palace to attend a surprise party, where they discover a corpse inside of a birthday cake along with a message from Moriarty, stating that Queen Victoria will die in 4 days' time. During the autopsy Holmes and Watson meet Dr. Grace Hart and the feral Millie. Watson and Holmes become enamored with Grace and Millie, respectively. By the end of the autopsy Watson declares that the corpse's death is indeterminable, while Holmes believes that the person was poisoned. Furthermore, he believes that the poison came from Gustav Klinger. The pair eventually locate Klinger, who is indeed in league with Moriarty. Before Klinger can reveal anything, he is murdered. Holmes decides that he must seek help from his brother Mycroft, who tells him that the murderer is someone close to him. Holmes mistakenly believes Watson to be the murderer and has him arrested. He comes to regret this decision, causing his emotions to return. Holmes goes to Watson's cell, only to find it empty save for a plate filled with red velvet cake crumbs. Deducing that his housekeeper made the cake and that Watson left the crumbs to send him a message, he tracks Watson and Mrs. Hudson, who is revealed to be Moriarty's daughter, to the Titanic, where the murder of the Queen is to take place. After apologizing to and freeing Watson, they rush to the main room where they discover a bomb, which Watson throws out a window. The bomb lands in Mrs. Hudson's boat, killing her. The film Holmes & Watson was scheduled to be released by Sony Pictures Releasing and Columbia Pictures on December 21, 2018 (United States), on December 25, 2018 (United States), on December 26, 2018 (United Kingdom) and on February 7, 2019 (Germany). The duration of the film is 90 minutes. With a budget of $42 million, the film grossed over $41.9 million. Holmes & Watson got low rating from critics. The audience dislikes the film either. Audiences polled by CinemaScore gave the film an average grade of "D+" on a scale ranging from A+ to F.